Norfolk, in the middle of winter. 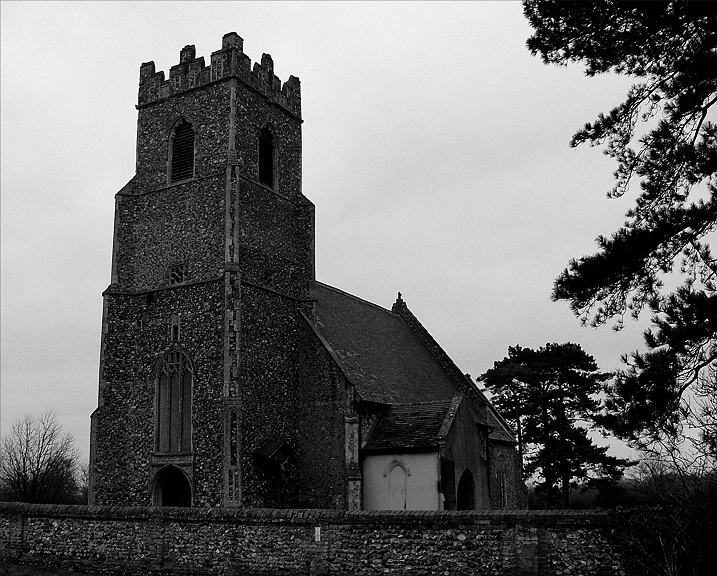 Broome church sits remote from its rather suburban village, on a long ridge running through the fields overlooking the Waveney Valley. Until the 19th century the Hall stood beside it, and when Cautley came this way in the 1930s the stable block was still there, converted into cottages, but this has now gone. Gone too are the hedgerows, and on a late afternoon in early January it was a bleak setting. The sun was going down beyond the hills to the west, and it was easy to believe that the 20th century hadn't happened yet, let alone the 21st. 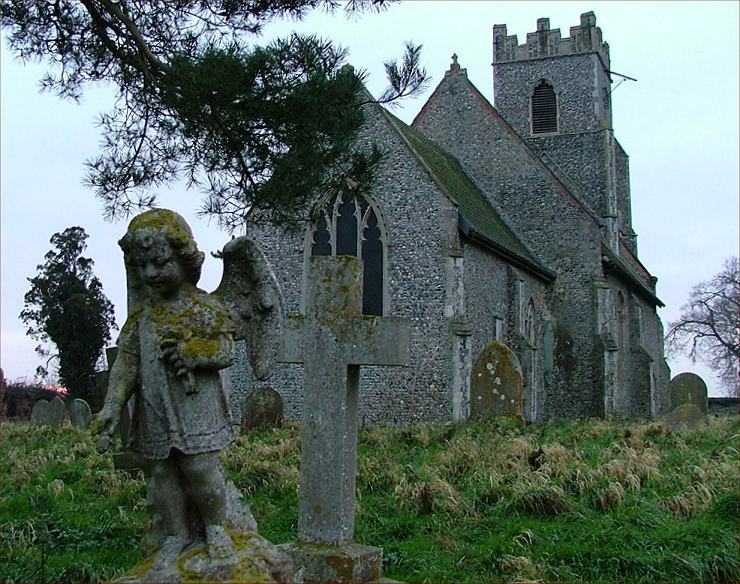 At places like Broome, I am always struck that our parish churches are, despite their medieval origins, essentially 19th century artifacts, and tell us more about our Victorian ancestors than they do about those from the 14th and 15th centuries. The Victorian shadow is cast long over Broome, and it is hard to think that, if our 19th century forbears could return today, that they would find anything outside of their understanding. The font, for example; 19th century on a medieval shaft; but more than that, the idea of a font and where it is and its place in the liturgy - these are all 19th century recreations, at least for Anglicans. 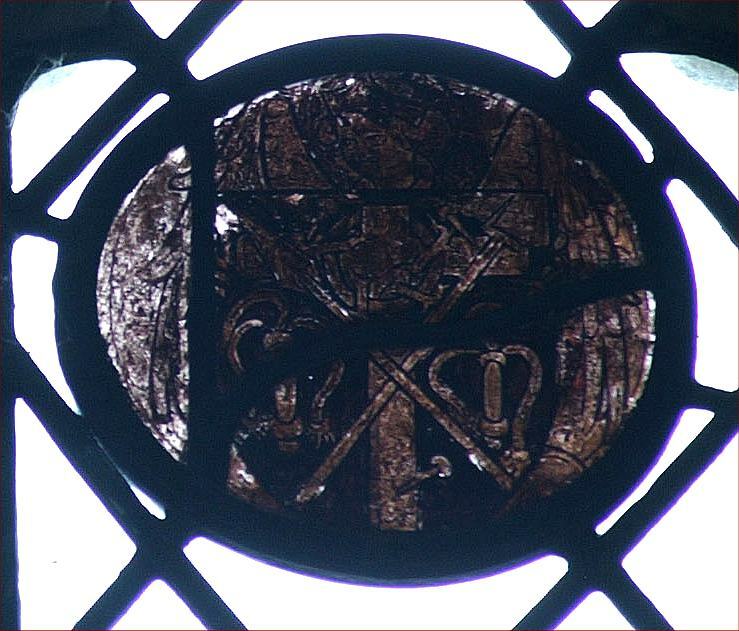 They reset the brass inlay in a window splay, perhaps recognising how rare the enamelling once so common to medieval brasses was. Theirs too the garish green glass in the east window - how depressing! Before the Victorians, the hand-pumped Regency organ in its imitation bookcase came here, and John Fowles received his 18th century memorial. There's a wonderful collection of bones and skulls about a timer on a ledger stone in the chancel, but the biggest mystery is the series of filled-in arches in the chancel walls. One was the entrance to the roodloft, but the others must have been into chancel aisles or chapels - all gone now. 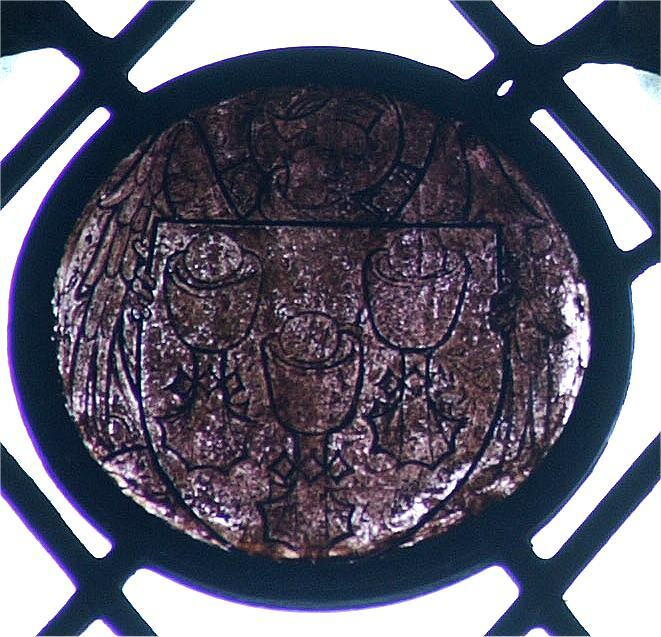 There are two medieval roundels in the south nave wall, and on this murky day it took DD's technology to decipher them - two angels, one holding a shield of chalices, the other a shield of instruments of the passion. There is one thing that I found puzzling. As DD finished off inside, I wandered around the graveyard in the half light. One the northern edge, there was a sharp drop into a wide passage below. It appeared to be a railway cutting; in the 1960s, Norfolk had hundreds of miles of line stripped away like varicose veins. The Victorians would shake their heads in wonder, in incomprehension: what on earth could be better than railways for transporting goods and people? And yet, as DD pointed out, the OS maps of this area show that Broome station was a mile or so to the south, on the Beccles to Bungay line. No line ran here, at least not in the 20th century. So what did I see? Arthur Mee was very impressed by the war memorial, which once stood proud in the graveyard but now leans up against the tower. It seemed to fit in with the mood of the place; a twilight in more than one sense, not sad exactly, but something surviving, only just.